Speaker will be Shane from The Fly Shop in Redding, talking about Battle Creek. This is in anticipation of the GPFF outing to the South Fork of Battle Creek scheduled for June 7-9. Sign up for the outing, also the Club's biggest fundraiser of the year, and attend this meeting to learn all about the river. Please note that this is an alternate date for this outing in the event high water prevents us from going in April. We are currently not planning on doing both trips. Deer Creek - May 17-19, 2019 (Sat-Mon) - Skill level - beginner to intermediate, Camping at Potato Patch. Fishmasters, Brad Gee and Mike Lippman. This outing begins on Saturday, May 17. Yes, there is a place in Northern California where there is virtually no pressure on the waters, where trout are waiting with bated breath (pun intended) for your fly. And you can spend a long weekend there with all of your fishing buddies from GPFF, and, at the same time, support GPFF and its programs. The place is Josh & Elaina Genser’s property in Tehama County. In past years, places on this trip were sold at the GPFF auction. This year, unfortunately, it looks like there won’t be an auction, because no one has stepped up to organize it. However, you can still help the Club financially and get a really cool prize for doing so by buying a space on the Battle Creek trip. The cost is only $200 per person. You’d pay many times that price to stay at the Fly Shop’s Battle Creek Ranch or Oasis Springs. The trip will be June 7-9, 2019. To sweeten the pot, the speaker at the Club’s meeting on May 14 will be a guide from The Fly Shop to talk about Battle Creek. That way you can be prepared with expert advice for the trip only a couple of weeks later. So, sign up on the GPFF web site just as you would for any other outing, except that the price is higher. All proceeds go to the Club. To the property is a four-hour drive, not including stops to eat, use the restroom and get gas. To get there requires a real four-wheel drive vehicle, because the last four miles are cross country. We have at least two vehicles with capacity for 13 people, so you can come even if you don’t own your own 4WD. There is no cell phone service, but we have running water, hot water, a shower and a flush toilet. I must warn you, though, that hiking up and down the creek can be challenging. If you have mobility issues you probably should not come. But everyone else should try it at least once. Last year GPFF member Luong Tam went on this outing and he created and posted this beautiful video: https://www.dropbox.com/s/9qcsz1ki5t4glvg/BattleCreek-3.mov?dl=0. If you have any doubts about whether this outing can live up to this hype, take a look at the video. Speaker will be GPFF member Luis Montes who will demonstrate how to balance your rod. Bring a rod to be balanced! Upper Sacramento River- Sims Flat Campground off highway 5, between Castilla & Dunsmuir Exits. There will be a potluck dinner on Saturday night after sunset, followed by a campfire gathering. GPFF strongly encourages car pooling. Contact the fishmaster Linda Friedman to coordinate rides, or, more generally, if you have questions. Look here for the fishout sheet a few weeks before the trip. Clay Hash will guide us virtually on the Lower Yuba River. Clay is also the Vice President of the Northern California Council of the Fly Fishers International. Mild backpacking to fish the beautiful High-Sierra country in the Rock Creek Basin. Little Lakes Valley Backpacking. If you would like to register for this trip, you must contact Ron Francis at 925-788-3390 to discuss particulars and alternatives to for this trip. IF THIS TRIP IS FULL, THERE MAYBE SAME DAY WALK IN PERMITS. PLEASE CONTACT RON DIRECTLY IF INTERESTED. Aug-14-18 (Wed-Sun) Fish master – Ron Francis. We will meet in Mammoth Lakes and stay Wednesday night in modest lodgings there or car camp in a Forest Serviced Campsite up Rock Creek Rd., to help us acclimatize to the 9000-10,000' elevations. Carpooling up and back is encouraged. The next morning we will hike in about 3 miles and set up a base camp (for 2 nights and 3 days fishing) at one of the nearer lakes. From there we will venture out to fish a variety of creeks and lakes. If some people would like a slightly shorter trip, it will be fine for them to walk back out Saturday, but only with a partner. If some want an extra day hiking out on Monday is possible. For safety, because of high altitude and bears you must partner or travel with the group. 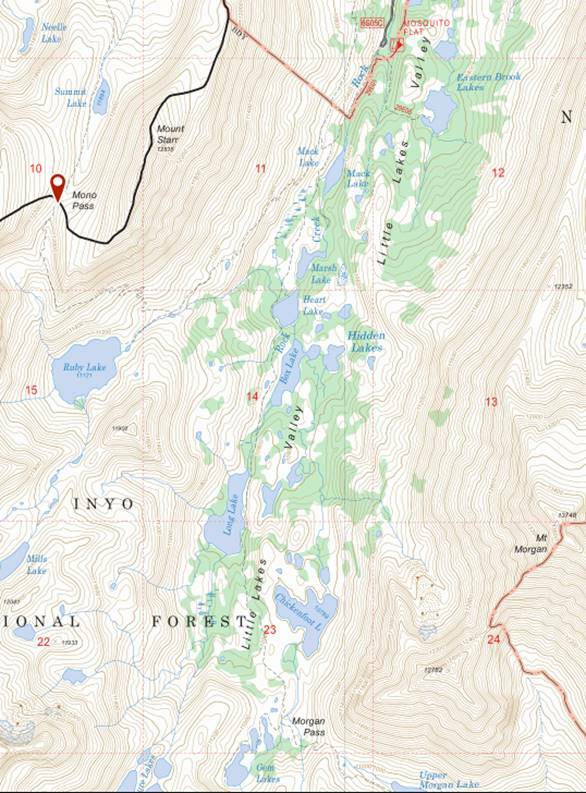 Backpacking equipment is required. We will arrange to share food and approved bear storage containers. The basin is a great place for beginners. Tons of fish and no waders necessary. The fish are generally small, but include goldens. The scenery is among the most beautiful in California, in sight of the tree line, in a breathtaking valley. The easy access to this beautiful chain of lakes make Little Lakes Valley popular for fishing, day hikes and beginning backpackers. Glaciers carved this extensive chain of lakes, both large and small. Wildflowers bloom in the high elevation framed by the spectacular 13,000-foot peaks of Bear Creek Spire, Mt. Dade, Mt. Abbot and Mt. Mills. Some evidence of historical mining equipment can be seen, along with an old road bed at Morgan Pass. This is an active bear area so you must use bear containers to secure your food and refuse. McCloud River - Our annual October Caddis outing.October 24 - 27, 2019 (Th-Su). Skill level - Intermediate to advanced(difficult terrain). Ah-Di-Nah Campground. Fishmaster - Kirston Koths. NOTE: This outing is located far from medical services, in a remote canyon where wading is difficult and injuries are not uncommon. This outing is a fun trip that will test (and hopefully improve) your angling skills, but it is not recommended for beginning anglers, those with limited wading skills, or people with health and fitness issues. GPFF strongly encourages car pooling. Contact the fishmaster at koths@sbcglobal.net to coordinate rides, or, more generally, if you have questions. Look here for the fishout sheet a few weeks before the trip. 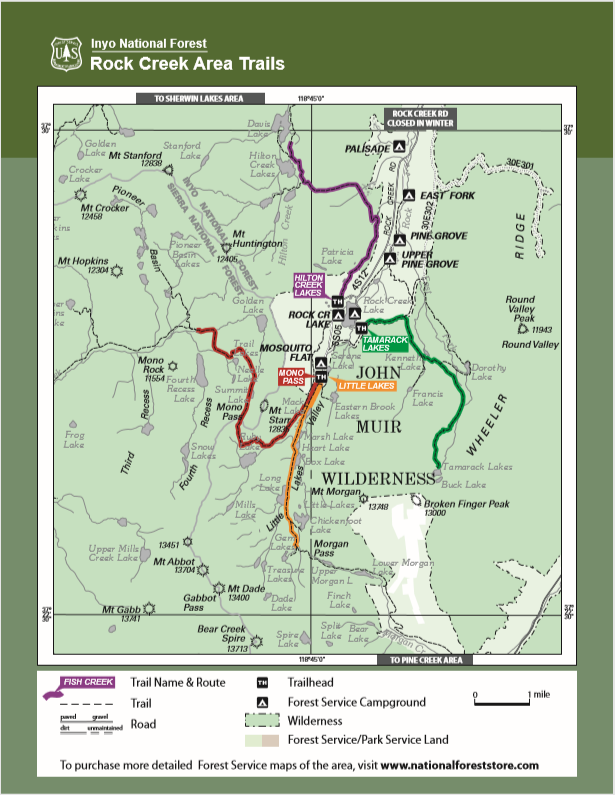 Here are maps of the Conservancy, the river from the dam to Ah-Di-Nah, and the upper river loop. 12 Sep 2018 GPFF Club Meeting- ANNUAL OPEN HOUSE!! 12 Dec 2015 FALL WORK PARTY - NEW DATE!